Competitive Examination. There are total 50 vacancies available in this BRBCL Recruitment 2018. Interested candidates having eligible criteria are advised to go through BRBCL official website @http://jvdtcareers.net. Online registration of BRBCL Diploma Trainee Jobs application starts from 25/04/2018 to 16/05/2018. This BRBCL Diploma Trainee Jobs Recruitment selection is based on written test and skill test. 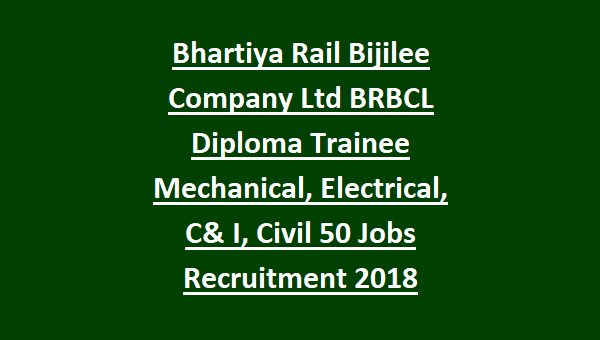 For Available vacancies, Age limits, Educational qualifications, Application process and other details of Bhartiya Rail Bijlee Company Limited BRBCL Jobs general recruitment 2018 are mentioned below. Click here to see the official notice of BRBCL Diploma Trainee Jobs Recruitment. Selected candidate will get monthly salary of Rs. 15500/- to Rs. 34500/-. Candidates must have completed full time 03 years diploma in relevant discipline with minimum 70% marks. For more qualification details see the official advertisement. Candidate should have maximum age limit is 25 years (For Land Ousters is 35 years) as on last date of the application. Age relaxation for Scheduled caste/ Tribes/ PHD will be applicable as per rules. Selection of candidates applying for BRBCL Diploma Trainee Jobs will be shortlisted based on the merit in written test and skill test. Written test will be conducted in two parts. Part I (Knowledge Test): Consists of 70 multiple choice questions. Part II (Aptitude Test): Consists of 50 multiple choice questions. Written test will be held on 28-05-2017. Skill Test: Candidates who have cleared written test are eligible to appear skill test. See the official notification for Exam centers and other updates. Candidate belongs to SC/ ST/PWD/ XSM are need not to pay any registration fee. Eligible candidates may go through the BRBCL official website of http://jvdtcareers.net to apply online. Online application process started from 25/04/2018. Last date to send applications is on or before 16/05/2018. 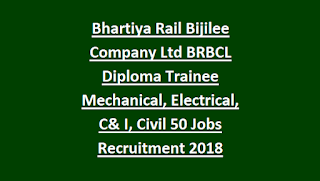 Click here to apply online for the BRBCL Diploma Trainee Jobs Recruitment 2018. Please share this BRBCL Diploma Trainee Jobs Recruitment Examination 2018 article to your friends.